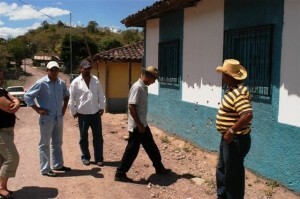 The four assassins who carried out the machine gun execution were members of the local police – Linton Omar Cáceres Rodríguez, Rolando Antonio Tejeda Padilla, Juan José Talavera Zavala and José Arcadio González. Despite a history of impunity for those who commit such crimes in Honduras, the four were detained and were convicted by a Honduran court on 1st July this year. 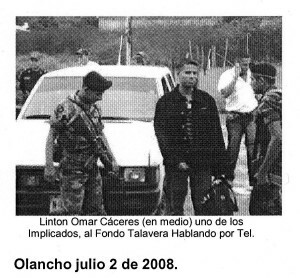 The MAO has asked a series of other questions about their escape: Who is it that wo uld want us to2nd July in Olancho: Linton Omar Cáceres (in the middle) and Juan José Talavera (on the phone) in army custody believe that they escaped on their own? Who is it who has helped them to escape justice? Who is behind their escape? Is it the same people who Who was responsible at the Brigade 115 installation when they escaped? Where were these people when they escaped? ENCA has written a letter to President Mel Zelaya urging him to initiate a thorough investigation into who was responsible for these escapes and to do all he can to ensure that justice is served in this case. The MAO has also demanded that the case of the assassinations be kept open in order to determine the intellectual authors of the original crime.